Hard to believe that January is already over! ... do not know where time flies! 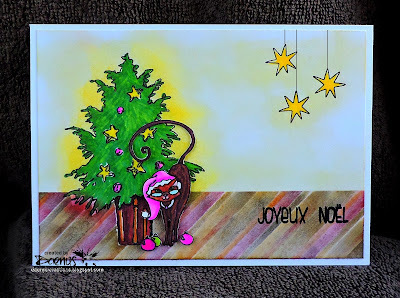 Today I used stamps from Scrap Plaisir and my Brand New Alcohol Markers that I got from my niece Karola for Christmas! It's my second try with these markers and I have to say I enjoy it! Ok, I'm still very timid with them but with more practice I'll get that out for sure! The striped part at the bottom of the card is made with a stencil (Heidi Swapp) that I have moved several times to make some sort of carpet or something similar to it. Baubles, stars and glasses are embellished with Wink of Stella. A sweet image and pretty card for our 'Spots and Stripes' theme at Allsorts challenge, many thanks for joining in. What a great design, loving the stenciled floor. Thanks so much for sharing at Allsorts challenge! I like your beautiful festive card and hopw you take our sketch :-)) You use a sweet image. Thanks for join us at 52CCT. Die Katze hat aber eine heisse Muetze!